Over the last few weeks, M. Dawuda's Grade 2/3 class recorded the song "What a Wonderful World", planned and created a music video. We shared it with the school at our S.O.A.R. assembly on Tuesday, May 1, 2018! Today we had the opportunity to check out the progress in our new building. 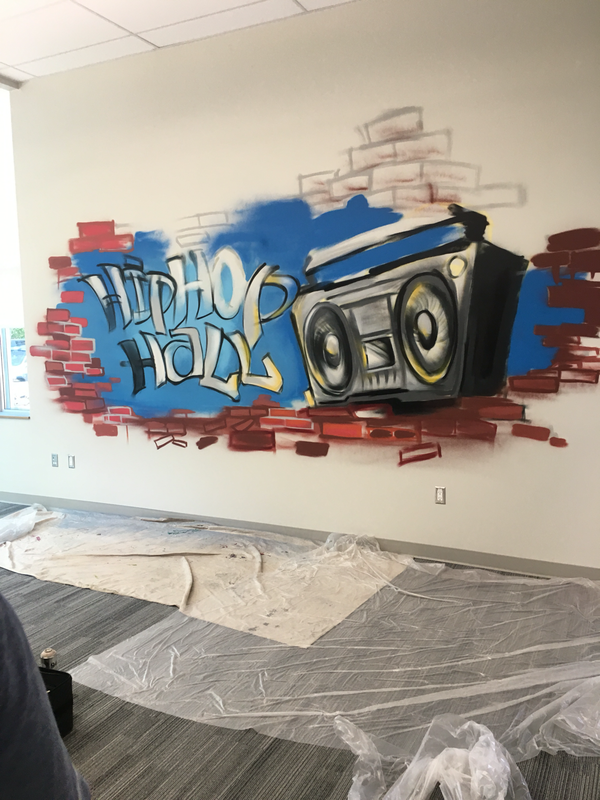 I am so excited to share more pictures of our awesome "Hip Hop Hall" room as the unpacking takes place! Until then, enjoy this sneak peak of our amazing graffiti wall by local Regina artist, Josh Goff. What's New in the Music Room this May? It is hard to believe that there is only about one month left of school! Here is what we have been working on in the music room at ÉCCS. Maternelle - The students are busy planting seeds and growing veggies. Our focus has been on cute songs like "Watch the Garden Grow", which go through all the steps to make a beautiful garden! 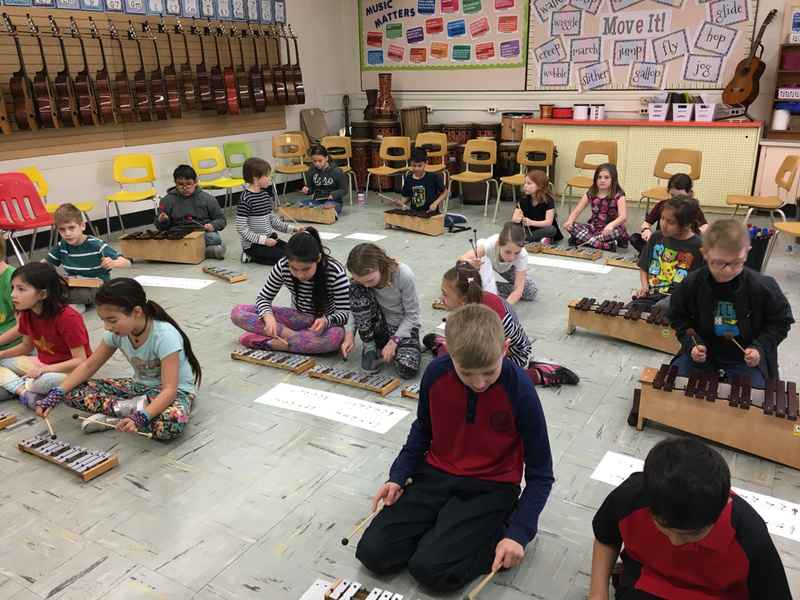 Grade 3/4 - Students learned about each instrument family (Strings, Percussion, Woodwinds and Brass) and demonstrated their ability to categorize each instrument. 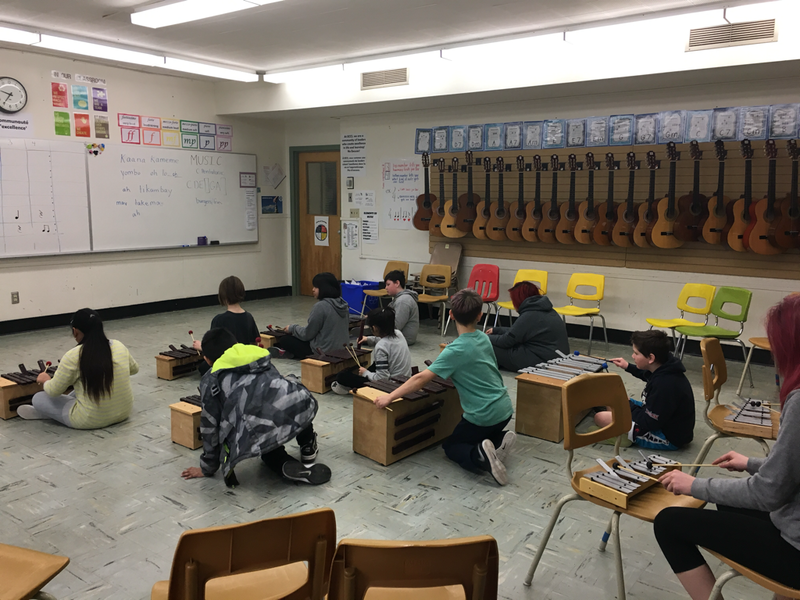 Grade 5/6 - Earlier in the month, we started with a music and movement study. In groups, students were required to create a class warm up. We are currently heading into our final project: creating a product and commercial to advertise the product. This project pulls all the arts education strands together: Music, Dance, Drama and Visual Art. Grade 7/8 - The past month has been a very exciting (at least in my opinion!) study of the jazz and more specifically, the 12-Bar Blues. First, students completed a web quest that had students research different types of blues songs from all decades. Next, students learned the call and response form of the blues and made their own lyrics. Finally, we went through the 12-Bar Blues form on the barred instruments with some jazz backing tracks. Students demonstrated their ability to hear the chord changes while playing! It was a really awesome class that brought all their knowledge together! Looking forward to a fun and exciting June. We will be getting outside in the sunshine with some folk dancing and more! During the month of March, we studied music from around the world in all grade levels. In particular, we looked at music from Western Africa. This month, we are using one of our folk songs and creating different arrangements using Orff and non-pitched percussion instruments. 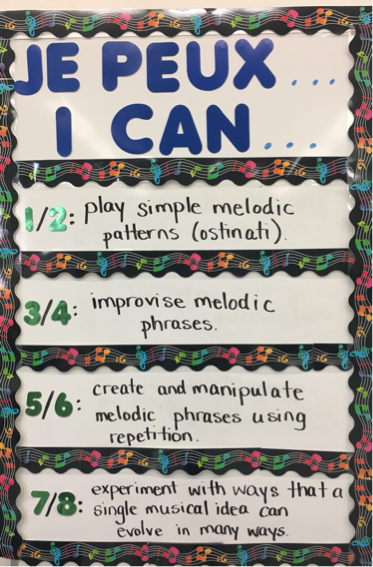 Each grade level will experiment with improvising using set melodies and learning to read to sheet music. We hope to put everything together for the "Farewell to Connaught on 4th" potluck at the end of the month! Practicing the folk song melody using sheet music! Learning how to set up the instruments in "C Pentatonic" and then improvising.